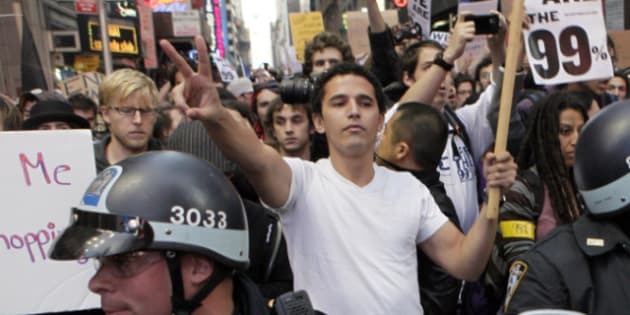 Where the pushers of Occupy Wall Street have erred so grievously is in comparing their struggle to that of the brave Arab Spring protesters who, even today, continue to bare their chests to real bullets. Protest-envy and the desire to suffer and to "win" like they did in the Arab Spring is couched in psuedo-militaristic terminology like "occupy" and "rebellion." This past weekend, the much-hyped Occupy Wall Street campaign went viral -- if only there was an easy cure. Certainly, it does not take a wild imagination to understand the deep grievances of the protesters. The once mighty and unparalleled American economy now wheezes and sputters, political blame-games in Washington have paralyzed promises of progress, millions of people have taken pay cuts, lost their jobs, or have foreclosed on their family homes. And while the U.S. struggles to pay its bills, its uniformed men and women soldier on in far-away sands and on multiple and questionable fronts -- all while the barons of Wall Street get richer on the backs of taxpayer bailouts. Not a pretty picture. Insofar as these are anywhere close to the grievances of the protesters, their loudly bellowed words are much more closely aligned with America's strong right-hook Tea Party than any socialist agenda. Despite this ideological confusion, the protesters are right to be angry -- and they should be heard -- as their Western democracy affords them. Where the pushers of Occupy Wall Street -- the Adbusters of the world -- have erred so grievously is in comparing their struggle to that of the brave Arab Spring protesters who, even today, continue to bare their chests to real bullets, to real tanks, to real torture, and yes, to real economic hardship. It is geopolitically and culturally insensitive to link the Wall Street protests to those in which the protesters enjoy no such right of assembly, are prohibited from voting, lack any freedom of expression, and are persecuted, jailed, or worse, for any manner of artificially-prescribed social deviance -- from the way they dress to their sexual orientation. Indeed, the Egyptian military kept the barrels of their guns warm this past week during their Coptic target practice, in the opening weeks of Libya's protests helicopter gunships strafed crowds, and the number of protesters killed by their own government in Syria now exceeds the total number of deaths from the September 11th attacks in New York. Lest we forget Neda Agha-Soltan, the young Iranian woman whose life of 26 years was cut short while she watched a street protest in Tehran, in 2009. A member of Iran's Basij militia fired a bullet into her chest -- a warning to the crowd. The shooter did not count on the killing being filmed -- now touted as the most-watched death in human history. Although the shooter was apprehended, he was never charged. No, this is not Wall Street, nor is it any other modern, liberal democracy for that matter. Protest-envy and the desire to suffer and to "win" like they did in the Arab Spring is couched in psuedo-militaristic terminology like "occupy" and "rebellion." Smart. If you study rebellions, you know that oftentimes a small percentage fully understands the cause and the rest are there to simply be a part of something big. Is it still a rebellion against economic disparity and big business when filmed on countless $600 smartphones -- or is it more of a "webellion"? I have witnessed true economic disparity in Sub-Saharan Africa. Numerous examples of towns suffering in horrible life conditions -- barefoot and hungry children in muddy streets surrounding a single mansion: the mayor's residence; gated and razor-wired with a new Bentley parked in its gleaming marble driveway. The difference is, the people in these conditions have no known path for improving their lives -- no hope of getting a job or a career. Having economic mobility to make your way in this world is a luxury. Those who count themselves as living in democracies can enjoy that privilege. This is the key difference between the conditions facing the Arab Spring protesters and the "occupiers" of Wall Street: options. The global economy is teetering on a precipice, with the European Union already hanging by its fingernails; China and India snapping at its kicking heels. We need innovation and we need to compete. That means capitalism. From the words of Adam Smith to Alexis de Tocqueville, the roots of the democratic freedoms we cherish (and the same ones that make our streets safe for protest) are inextricably steeped in the richness of free market enterprise. Fortunately, for the Wall Street protesters, the same political system that keeps them from being shot is the same one that grants them a legitimate voice. If done with focus, their protest may in fact bring about change. And they have a point. There are scores of publications -- from the latest OECD numbers, to the US Congressional Budget Office, to the Economic Policy Institute - that corroborate the protesters' claims of gross inequality. And yet to bring about change will require focus and it will require political momentum -- albeit from within the very system they protest. The so-called "rebellion" is the wrong path. They should use their voices to improve the system, not to tear it down. This is not their Arab Spring.